Editor’s Note: This is the message I shared for the devotion at the gathering of Pittsburgh Presbytery Malawi Partnership Ministry Team on September 17, 2012. We were privileged to have 27 visitors from Blantyre Synod with us as we celebrated the 21st anniversary of the Partnership between Blantyre Synod CCAP and Pittsburgh Presbytery. For more information on the Malawi partnership, visit the partnership’s web site. Ecclesiastes 4:9-12 Two are better than one, because they have a good reward for their toil. For it they fall, one will lift up the other; but woe to one who is alone and falls and does not have another to help. Again, if two lie together, they keep warm; but how can one keep warm alone? And though one might prevail against another, two will withstand one. A threefold cord is not quickly broken. Have you ever thought about rope? I’ve not spent much time thinking about it until recently. My daughter just “tied the knot”, so to speak, and she did it in Chicago, of all places. Which means that old Dad was driving the truck west with all sorts of things tied to the roof. I needed to make sure my rope was good. Take a look at a rope sometime. Here’s what happens when a rope is made: first, you take a fiber, like cotton, or hemp, or even nylon, and spin it to the right as you make it into a thread of yarn. Then you take a number of yarns and give them a left-hand twist to form a strand. Finally, you take three strands and twist them to the right and you get a hawser, or a rope. If you take three ropes and spin them back to the left, then you get a cable. Interestingly enough, what gives a rope its strength is the fact that all of this winding creates a certain amount of friction in the fibers. When stress is placed on the rope as a whole, the fibers literally pull on each other and hold themselves together, thus making sure that your daughter’s steamer trunk stays on top of your truck, your anchor doesn’t stay stuck at the bottom of the river, or that your wet clothes stay on the line and don’t end up in your yard. 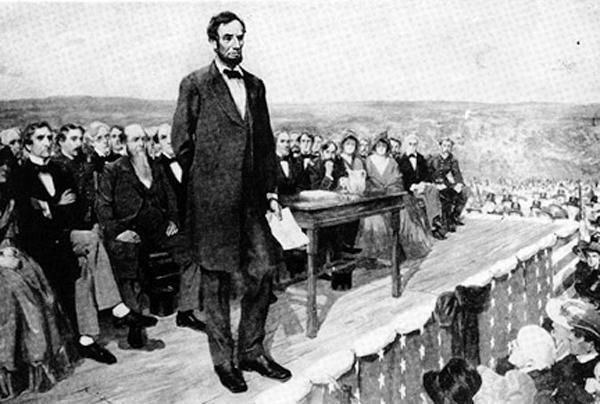 For centuries, rope was made in a special structure called a “rope walk”. 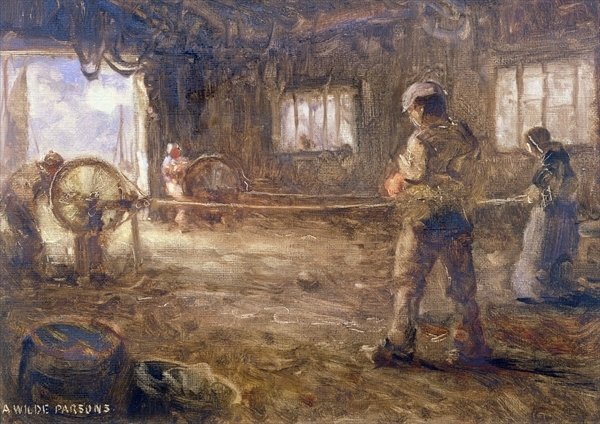 Hooks would anchor the ends of each strand onto a wheel and the rope-maker would walk as far as three hundred yards playing out the material while his son turned the wheel to apply pressure to turn the fibers into yarns into strands into rope. The tall ships of the 1700’s, for instance, required some long ropes – which meant some long rope walks. Fascinating, isn’t it? Here you thought this was just a rope. A hawser-laid rope, as you can see, because it’s got the requisite three strands. Swell, Pastor Dave. But does this have anything to do with the Malawi Partnership? Does this connect with either the scripture that we’ve heard or the visit we are sharing? Or is this just indicative of the fact that preachers have way too much time on their hands? What are the fibers of the strands of the ropes of our lives? Just as a rope is made from innumerable fibers that are woven together in a specific way, so too the relationships we share – here in Pittsburgh, there in Malawi, and in between – are built on simple acts of daily service and love. You know we love our partnership meetings. It’s a lot of fun to come together and sing songs and eat food and hear news from old friends… but those daily acts of service and love for the body of Christ, well, we’re not so sure about them. Extending forgiveness to someone who you think may have wronged you; reaching out (again) to someone who has ignored you; looking across the table at someone who you think is wrong about an important issue… It doesn’t always feel very good: in fact, sometimes it can feel like you’re being all twisted and knotted. It’s hard to be always thinking about someone else, to feel yourself being crimped and spun around. So we can get apathetic, or contentious, or cranky from time to time – because we don’t always like to do these things. It can be tempting to bail out on partnerships of all stripes. Unless…unless you’re willing to believe that there may be a rope-maker out there. Unless there is Someone who can take the essence of your being – your YOU – and gently weave and shape that into something that’s useful, something that’s strong, something that’s beautiful, something that could even save someone’s life someday. That’s what I’m asking you to believe today. The church needs people – and congregations- who will stick together in simple acts of daily obedience. But here’s the warning: that in the ins and outs of daily life, you’re going to feel some stress and strain. Some friction, if you will. What will that do to us? Will it drive our congregations, our partners, apart? Or can it help us cling more tightly to each other and to the relationship that God has given us, just as the friction in the rope actually binds it to itself when strength is needed? We can do that, you know, if we lean not only on the skill of the rope-maker, but on the presence of the third strand. God promises his Holy Spirit to sustain us in our relationship with each other and in faithful service to the world. Please don’t think of this partnership as a private little contract between Blantyre and Pittsburgh, or between Wexford and Michuru, or even worse, between you and your friend across the ocean. Our partnerships of any stripe are not our own. Think of this commemoration of partnership as the time when formally and officially we are recognizing that in this relationship there are three strands: Blantyre, Pittsburgh, and the Holy Spirit. And God, like a master rope-maker, is patiently walking up and down the pathways of our lives braiding us together into a hawser-laid love – a rope of three strands that will held fast when it is tested. I don’t know about you, but I use rope every now and then. And the next time I do, I’ll be thinking about the task at hand: tying down the luggage or hanging out the laundry. But perhaps we can join together and say that when we use rope, that will be a reminder for us that we can expect to know something more about God’s purposes for the world by watching the ways that our churches treat each other. As we live your lives in front of the rest of the world, we will pray that God’s power might flow through us. Thanks be to God! Author’s note: the following are my notes from the ceremony in which my beloved daughter, Ariel, and her best friend, Drew, committed their lives to each other. For reasons explained on their own blog, the two of them decided to call this rite an “Uncivil Union”. To say that it was a “stretch” for Pastor Dad would be more than fair. To say that it was a blessing would be more than true. Although I did not have a clear picture of what would happen or how it might happen, I was blessed to participate. In addition to their own description of the event, you can see photos by clicking here. Ariel and Drew exchanging their vows for the future. I am deeply touched that Ariel and Drew offered me the chance to share a few thoughts at their Uncivil Union. Many people, if they choose to marry, feel that they have to come to me as a pastor and therefore I have a certain amount of leverage vis-à-vis the law of supply and demand. They want my signature on a piece of paper, and so they have to let me talk. But Ariel and Drew didn’t want or need my signature, and they invited me anyway. That is a gratifying thing, and I am humbled and overjoyed by it. 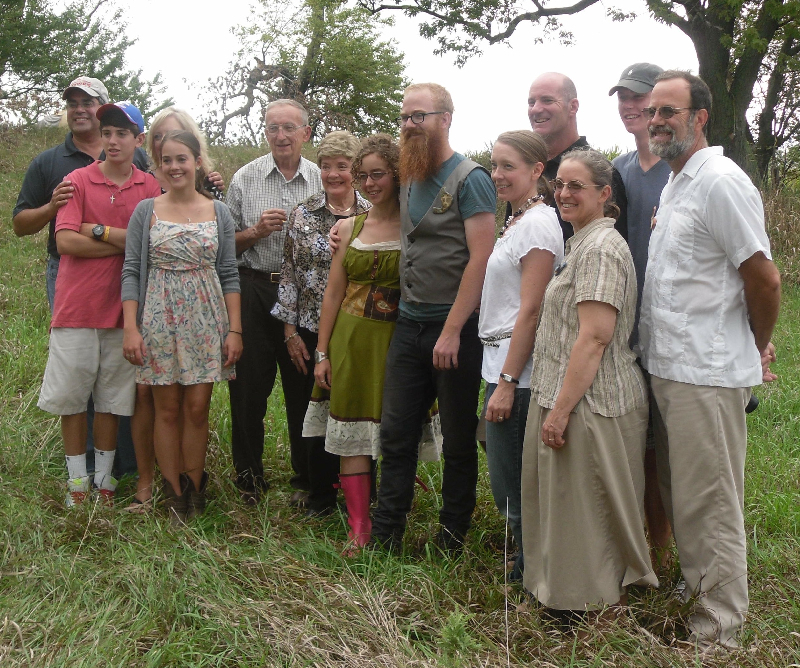 We gather to plant trees on this occasion – two pecan and three American Plum. As we mark this union by the planting of trees, it is fitting to remember that our Story starts with a tree. When the Creator of life, the Author of all that is, decided that he wanted us to understand who we were, whose we were, what we were called to do and be; when he sought to assure us that we were beloved and to give us meaning and purpose in life; he did so by using trees in a garden. He put us in a place that he had spoken into being and invited us to join him in caring for it. He used trees to establish boundaries and confirm identity and provide sustenance. “Elijah’s Garden” is a spot near the peak of Mt. 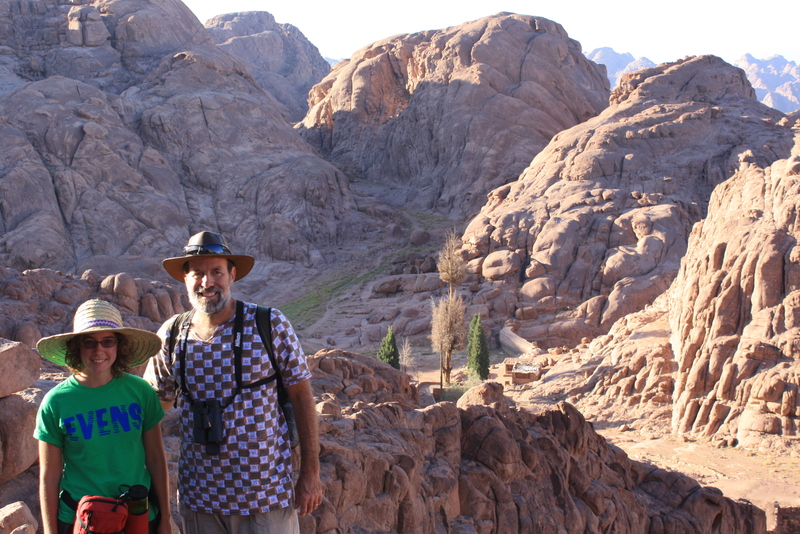 Sinai where Elijah is said to have been nurtured under the broom tree. Ariel and I were able to be there in 2010. The roots of these olive trees in the Garden of Gethsemane were carbon dated to be at least 2300 years old…meaning that they had been there for three centuries when Jesus wept amongst them. And now, we come to the place in the Story where you’ve asked us to help you celebrate what God is doing in your lives by planting trees. There are a few things about trees that will be helpful for you, and us, to realize as we do so. Trees have roots. Today, we sit here under these canopies and you are surrounded by the faces of people who have known and loved you both for a long, long time. You did not come from nowhere; you have been shaped and taught and blessed and loved by these people here. What a crew! Do not ever, ever take this, or them, for granted. Continue to explore how deep those roots are, and to cultivate space for your roots to grow even deeper in the context of the experiences that have made you who you are today. Trees bear fruit. Never forget that God intends to use your friendship, your union, to be a blessing to the world. You are here because you believe that in each other, you will be strengthened. Great. You are more and better able to be the selves that you can and should be because you are together. That’s right. Remember that your lives, your love, your relationship, is designed to bear fruit. You are a part of what God is doing in the world. As Bonhoeffer says, you are now a “chain in the link of generations” that God is using to write his story upon the earth. Trees need community. When my wife had the idea of a tree planting, we decided that it would be nice. But the more we researched, the more we realized that giving someone a single fruit tree is often a fool’s errand – because it can only do what it is created to do in the context of a community. Those pecan trees will pollinate each other. Those plum trees will send out roots and suckers that will meet underground, even as their pollen is exchanged above ground. You need to be with others in order to be the selves that God has given you. In fact, even though our Story starts with a tree in a garden, it ends in a city. The book of Revelation describes the community that God intends as one where we are together in light and in truth. If we do things right, both today (in terms of helping you two tie the knot) and throughout our time on earth (in terms of taking care of our roots, bearing fruit, and being in community) we will be developed into that community that John describes. 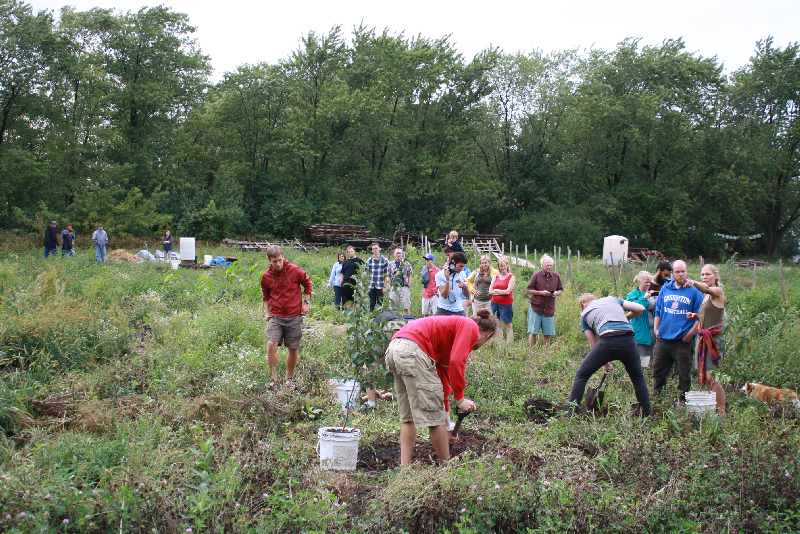 Planting the trees at the White Rose Catholic Worker Farm in Monee. So I have a little homework for those who are listening to this. We’ve heard that Ariel’s friend Ruth, clear over in Uganda, is going to plant trees today to honor this Union. That’s a great thing, and it’s a mark of her love and care for Ariel. That’s great. I wonder what it is that the rest of you will plant – today, and in the days to come. Care for the earth; care for each other. Be stewards of this garden we’ve been given and the city that it’s becoming. It is a beautiful and wonderful thing to plant – to plant trees, and anticipate nuts and plums; and to plant time and energy and love and to wonder how and where growth will lead us. the communion of the Holy Spirit. Amen. Craig Barnes, pastor at Shadyside Church, wrote, “We live by grace”. Only 4 words – maybe the sermons at Shadyside are really brief. Jesus wasn’t the only one to think about it, of course. In his day, there were a number of Israelites who were sick and tired of living under the rule of the Roman Empire. Many of those people looked back to Israel’s “glory days”, when King David or Solomon sat on the throne and Israel was not only free, but something of a power. As some of those people talked, it was easy to look back in idealism and remember only the wonderful things about having their own king, and omit the kinds of things that Kings do – the things that Samuel talked about when he was warning them about having a king. 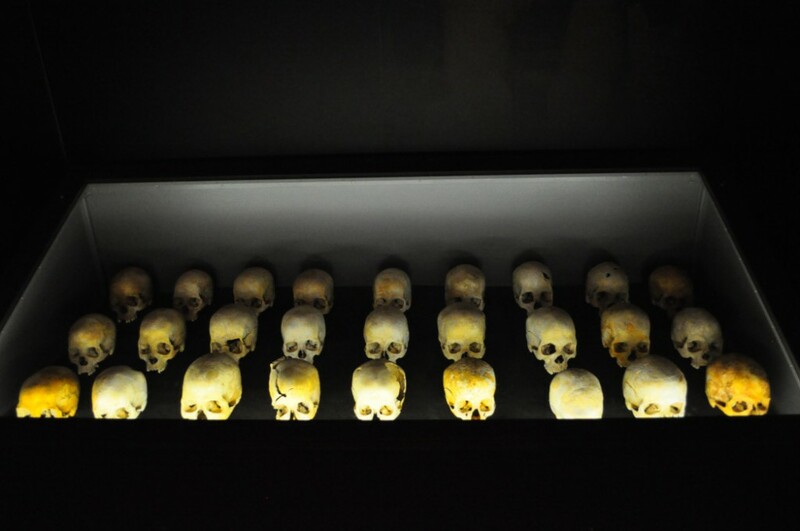 It was easy to skip over the generations of terrible kings and the decades of exile and the horrors of idolatry – all these folk wanted was a shiny new king to replace the Romans. But when Jesus spoke of the Kingdom, he was looking forward, not backward. 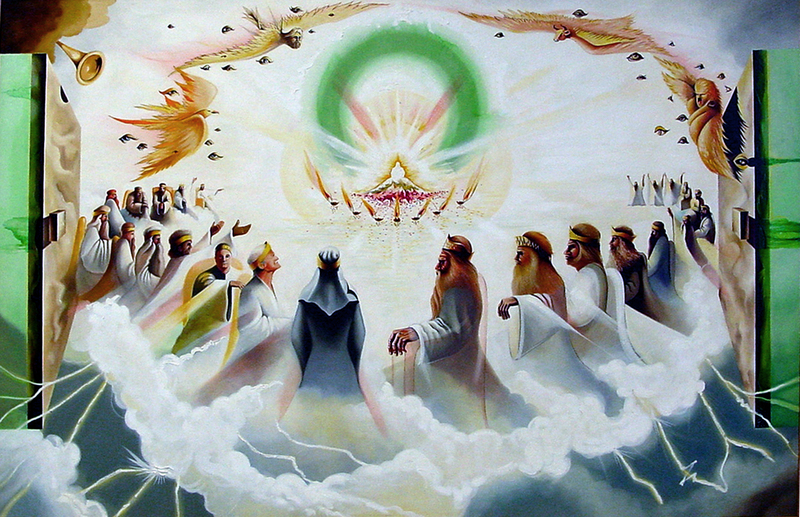 He was taking a glance around, and saying, “You know, the Kingdom of God is here.” And he peered into the future and said, “The Kingdom is coming”. And because Jesus was talking about a Kingdom, especially in his early ministry, he was incredibly well-received. Even when he talked in crazy parables, some of which you heard earlier, people ate it up. The Kingdom is like a treasure that is more valuable than anything else… The Kingdom is like a net that amasses a ton of fish – it is wide and varied…The Kingdom points towards a final accounting with the creator. People loved that stuff – even when they didn’t know what he was talking about. What got Jesus into trouble, then, was when people started figuring out what he meant. As long as he was talking about some vague notion of “The Kingdom”, it was great. When he got specific about what his notion of the Kingdom meant, well, that’s what got him killed. Do you remember that old show The Music Man? Professor Harold Hill comes into River City, Iowa and promises all sorts of change, beginning with teaching the kids how to play music. He gets the townfolk all fired up and they place an order for the instruments – an order what would be delivered by the Wells-Fargo company. A hundred years ago, Wells-Fargo was the UPS of the nation – a series of wagons and trucks that made home deliveries. In this scene people see the delivery wagon arriving – and it is good news! What’s in the truck? In The Music Man, and in real life, of course, the wagon arrives. And it does not – it cannot – contain everything that everyone is looking for. The musical instruments are there, but not everyone gets their double boiler or their rocking chair or their salmon from Seattle. So when the Wells-Fargo wagon is unpacked, many, many people are disappointed. That’s how it always is with prophets. If you are telling people that the Kingdom is on the way, that’s great! Everybody wants to see thing changed. Everybody likes the guy who says that salvation is coming if we can just hold on a little longer. The problem is when someone – like Jesus – starts saying, the Kingdom of God is at hand. The Kingdom is here. The first thing that a Messiah has to do is convince us to stop looking for another Messiah. He has to talk us into letting go of our own cherished notions of whatever God’s Kingdom looks like so that we can get on board with the Kingdom as it is revealed and shaped by God through Christ with the power of the Holy Spirit. Do you remember last week, when we started this message? We talked about the importance of modifying words. 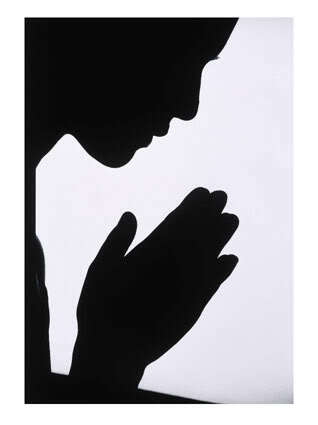 We don’t simply pray to “Father”, we pray to “Our Father.” Those three letters make a difference, don’t they? That idea is back again. We pray for the Kingdom to come. But not just any Kingdom. And, fortunately for some of my friends, not just my idea of the Kingdom. We beseech our Father to reveal his Kingdom. We know that we need a Kingdom – and Jesus says, “Ask God to show you what his Kingdom is all about. Great, Jesus – you tell us. 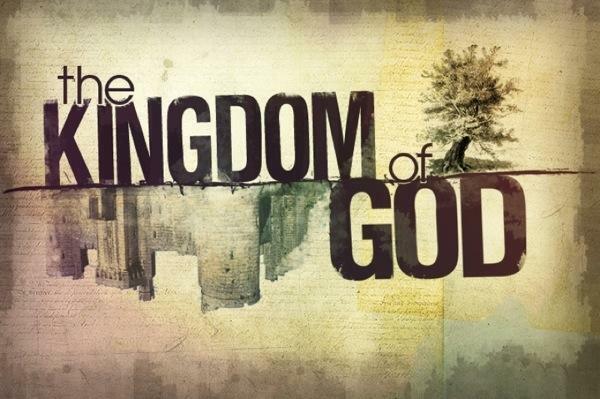 What is the Kingdom? Give me the manifesto – the constitution – the lowdown. Tell us, Jesus, what exactly is in that wagon called the Kingdom. But Jesus doesn’t do that. He talks instead about a kingdom that is more about process than product. Do you remember what he said in the Gospels? The Kingdom is like a man who plants seeds all over the landscape and waits for them to grow. The Kingdom is like a woman who kneads a little yeast into the dough. The Kingdom is like a farmer who’s discovered that his enemies have mixed bad seed in with his good seed, and now he waits for things to sort themselves out. The Kingdom is like a net that gathers all sorts of fish, not only the kind that I like, and then allows someone else to sort them out. But Jesus, what does that mean? What does the Kingdom look like? I don’t know everything, but I know some of what the Kingdom wagon contains. The Kingdom contains justice – where people are treated well and hope is possible, the Kingdom is growing. The Kingdom contains grace – where mercy is both offered and accepted, the Kingdom can take root. The Kingdom contains faithfulness – where God’s people hold on to the truth, to God’s intentions, and to each other, the Kingdom is bearing fruit. That may be some of what’s in this Kingdom wagon, but how do we live into that? 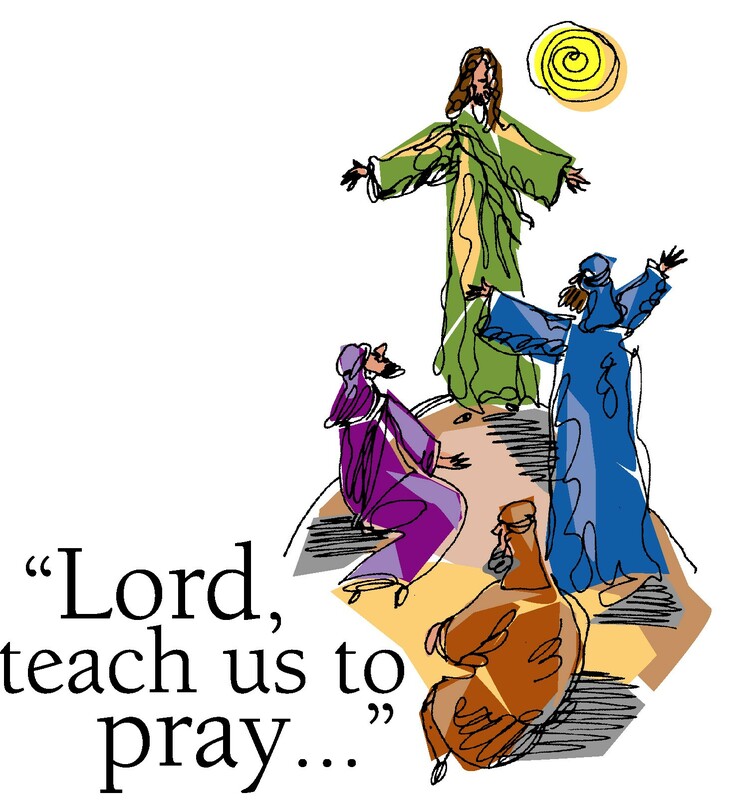 What shall we do with this portion of the Lord’s prayer? There are times when some of us want to pretend that the Kingdom is already here in all of its fullness. We can be tempted to think that if we just vote for the right person or get the right program in place, everything will take care of itself. That kind of idealism does not recognize the truth that we are a sinful people who live in a broken world. 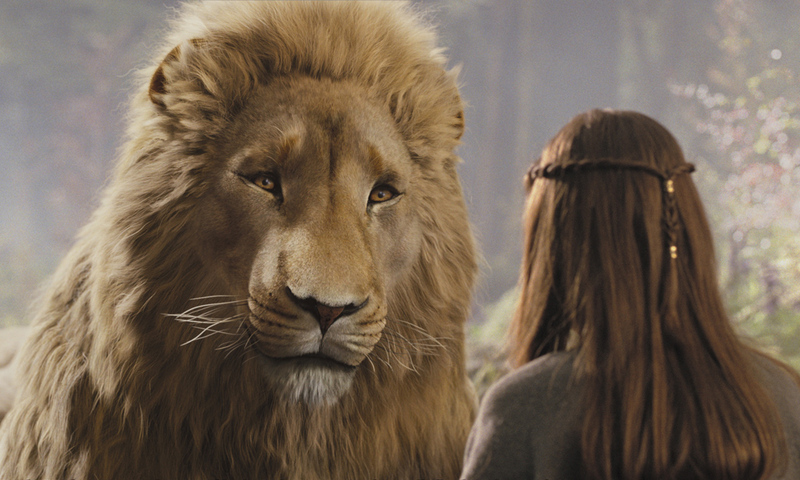 The Kingdom is among us, but it’s not here because we’re so great. And there are other times when we want to throw our hands in the air and say, “Who am I kidding? Justice is an illusion. There is no grace. Faithfulness is impossible.” But this is also a mistake, because it fails to recognize the presence of the Holy Spirit in the world. Fatalism is an unfaithful response because it denies the power of the King behind the Kingdom. We cannot blindly expect that every day, things are getting better in every way. And we cannot throw in the towel and say that nothing ever changes. Instead, we pray for those gifts of justice, of grace, and of faith to show up in our own lives. And we ask to be able to see signs of them along the roads that we travel. And we press on, knowing (thank God!) that the Kingdom is not ultimately ours to manage or control. So we are on this road, and we are praying for the Kingdom. Sometimes we think it’s like the Wells-Fargo wagon, full of goodies just for us. But mostly we know that it’s God’s business coming in God’s timing, and we struggle to be faithful to that. Will we stumble? You bet. Will we fall? From time to time, you know it. What will we do when that happens? We’ll repent. And then we’ll repent some more. We will keep looking. We will remember that when we are converted, it’s not to a certain set of ideas that are somehow “righter” than our old ideas. When we change our way of thinking and our mindset, we do so as we embrace a relationship with the one who is teaching us to pray. The Kingdom is here. And the Kingdom is coming. We pray for it. We are not it. But we belong to it. And we can see it. And on our best days, we can reflect it. Thanks be to God. Amen. The Christian Century, September 5, 2012, pp. 20ff. 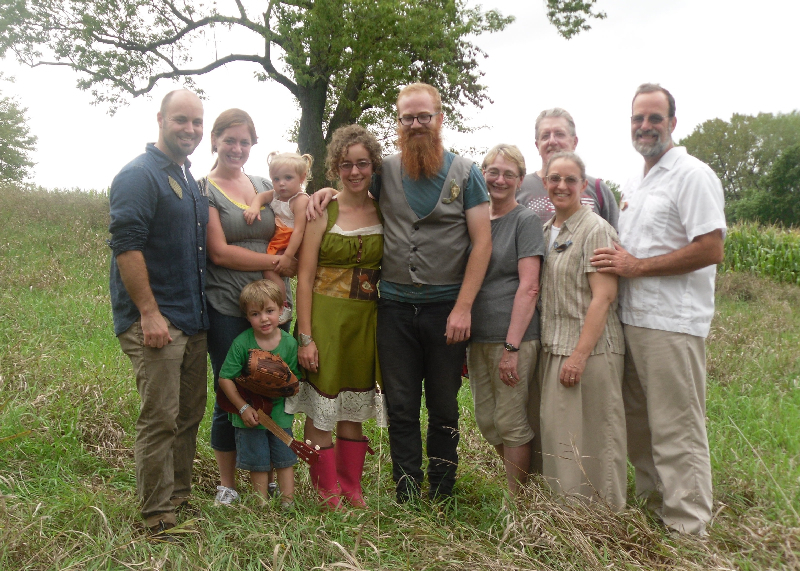 The week of August 27 was a real adventure for our family as we shifted our attention to the town of Monee, IL, where Ariel and her beloved, Drew Daniels, pledged their lives to one another in an Uncivil Union ceremony. 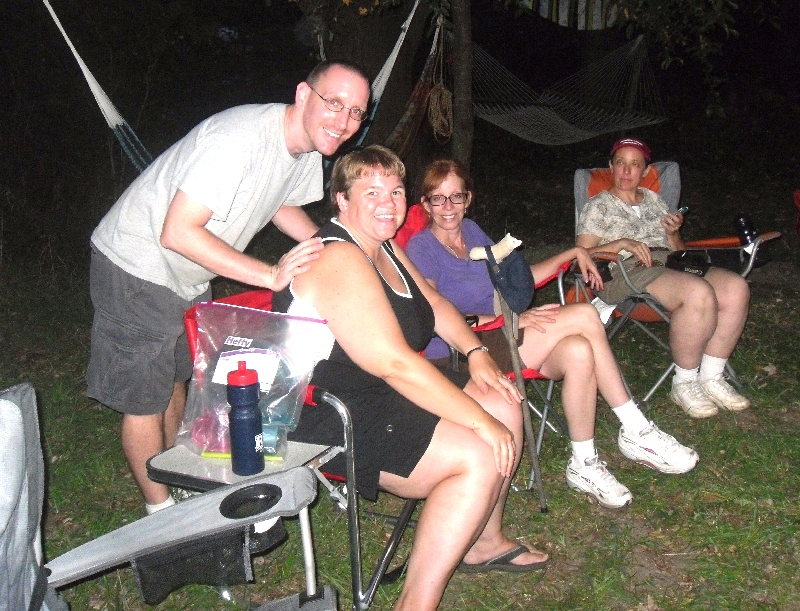 The short version of that is that this was a gathering of family and friends who were committed to helping them live into their best selves as they join together for the years to come. If you’d like a longer, and much more theological explanation of Uncivil Union, then check out their blog entry on that topic. 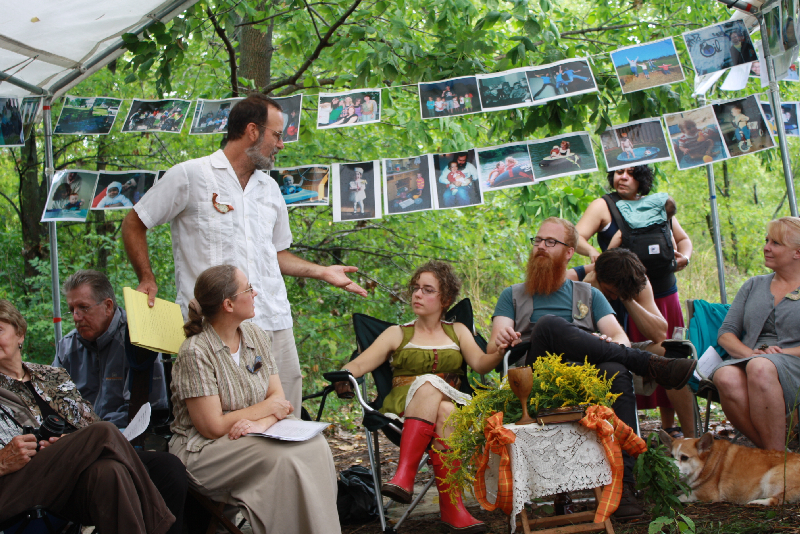 The Union took place on a ten acre plot of ground currently being cared for by The White Rose Catholic Worker House in Chicago. 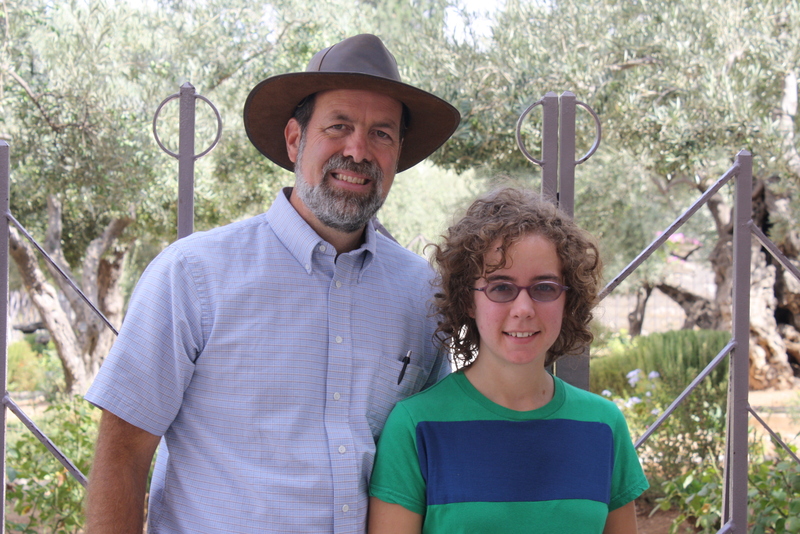 They grow organic vegetables and are learning about the ways that God’s earth can be restored and revitalized. 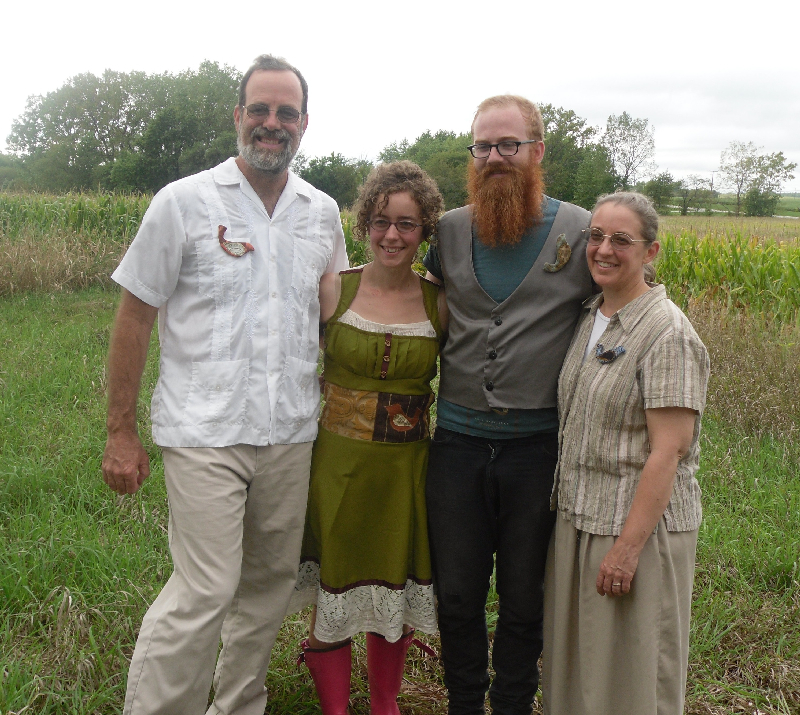 Ariel, Drew, and I arrived on Monday and joined with John & Regina from the White Rose to begin laying the groundwork – building toilets, harvesting crops, etc. Sharon and our friends the Prevosts arrived on Wednesday, and more friends and family streamed in as the weekend came closer. 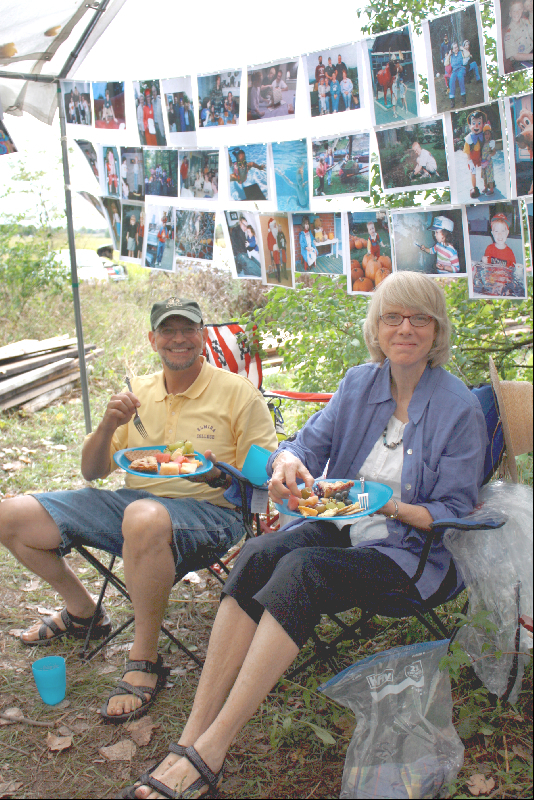 Eventually, the land was dotted with tents (and one massive RV) and the ceremony itself took place on Saturday. 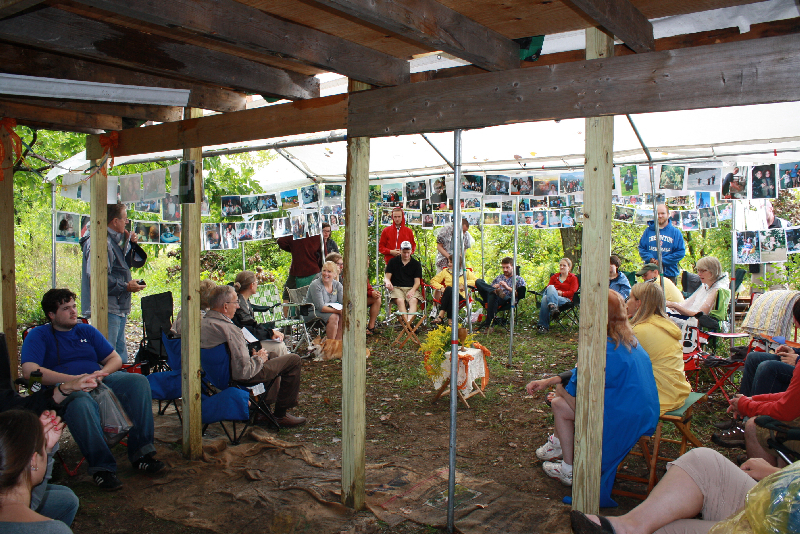 It was a Quaker-style ceremony, where every member of the community was invited to speak. A variety of folks shaped the service, which included poetry, music, and a meditation (which you can read here) by yours truly. The skies were brilliantly blue all week…until Saturday, where we ended up moving under canopies for the actual ceremony. It was a gift to be there, and we are grateful to all who supported Ariel and Drew by your prayers or your presence, your encouragement and your belief in them. Here are some scenes from the week! 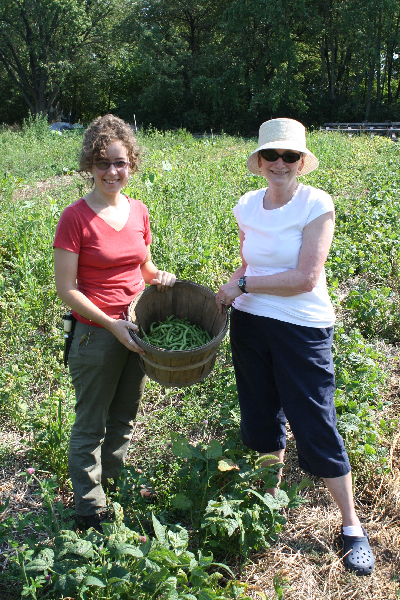 Ariel & Barb showing the afternoon’s harvest – string beans! Matt & Erlina Mae Adler, along with my sister Debi, made the trip and lent a hand with everything from weaving to decorating to shoveling horse manure! 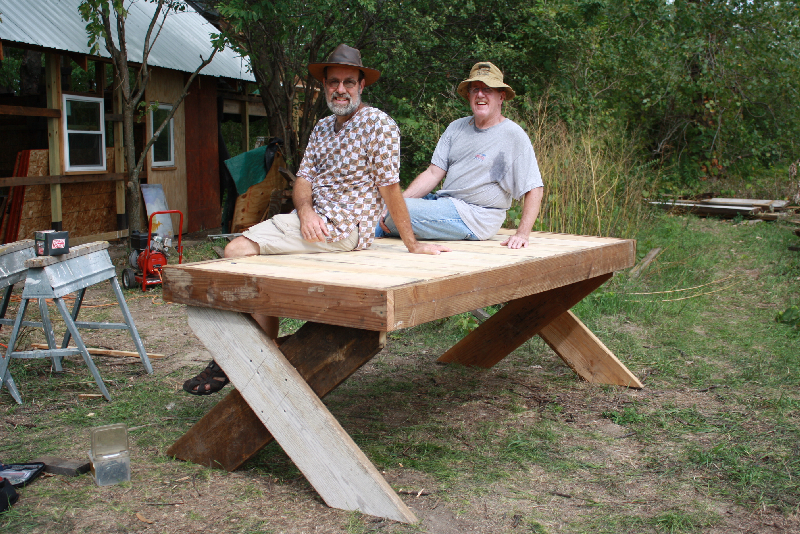 Don and I, with some able assistance from my brother-in-law Bob, put together the biggest and sturdiest picnic table I’ve ever built. Also the only picnic table I’ve ever built. 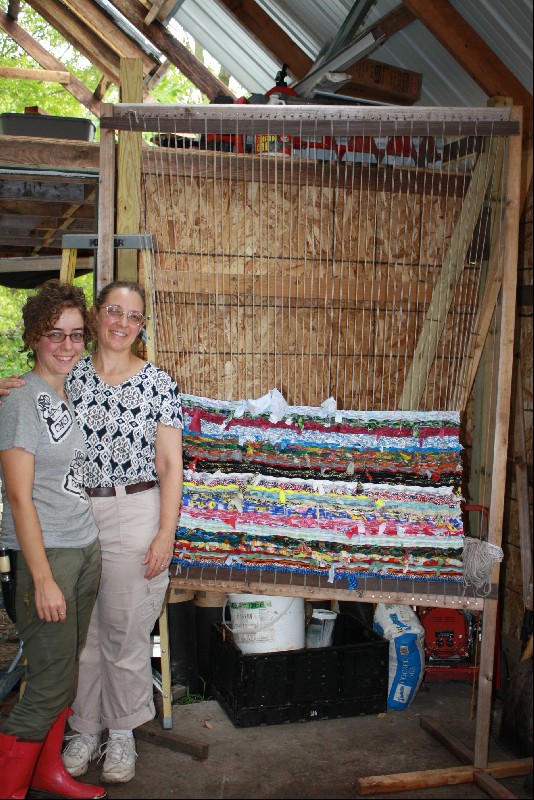 One of the “assignments” was for each attendee to bring a strip of fabric to weave into a wall hanging for Ariel & Drew. Here, Sharon and Ariel contemplate the project thus far. Plan “A” was to enjoy the afternoon sunshine in a meadow dotted with Queen Anne’s Lace. Under the rainy skies, we adapted the storage shelter and a couple of canopies to host the actual ceremony. Lynn and Marc Portnoff made one of the most important contributions of the day: in addition to reading a very meaningful communication from their daughter Ruth (Ariel’s best friend from 2nd grade through graduation), they brought the pies from Pittsburgh! 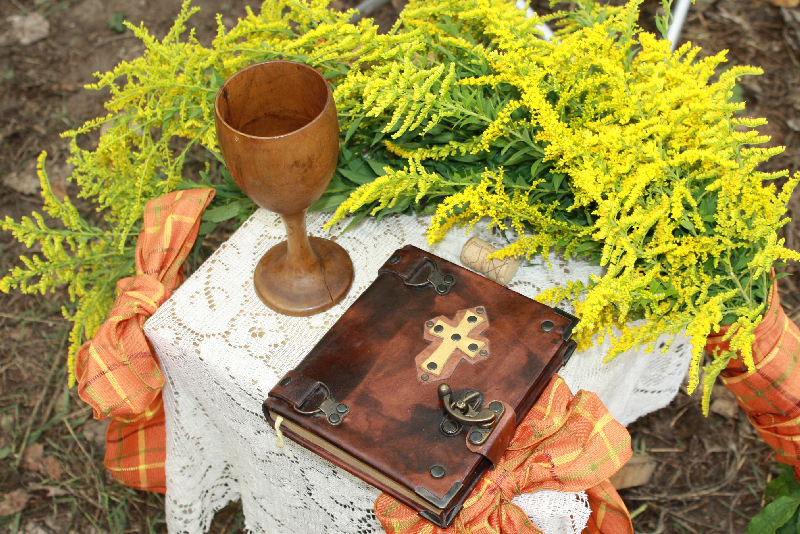 This is the book in which Drew and Ariel wrote their vows – I brought it back from Corinth, Greece in 2008. 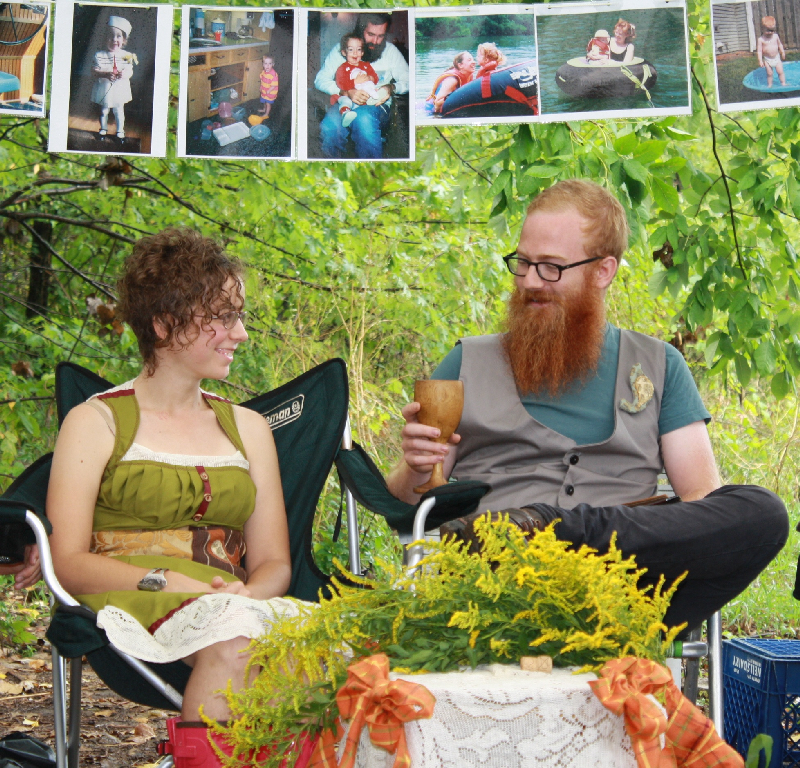 Ariel and Drew exchanging their vows for the future under the canopy, surrounded by the images of their past and the friends of the present. I was privileged to be able to address a few words to the honored couple, as well as the rest of the gathering, on the topic of trees as a metaphor for our lives. You may read more about that in a blog to come…. The ceremony ended with the planting of three plum trees and two pecan trees. 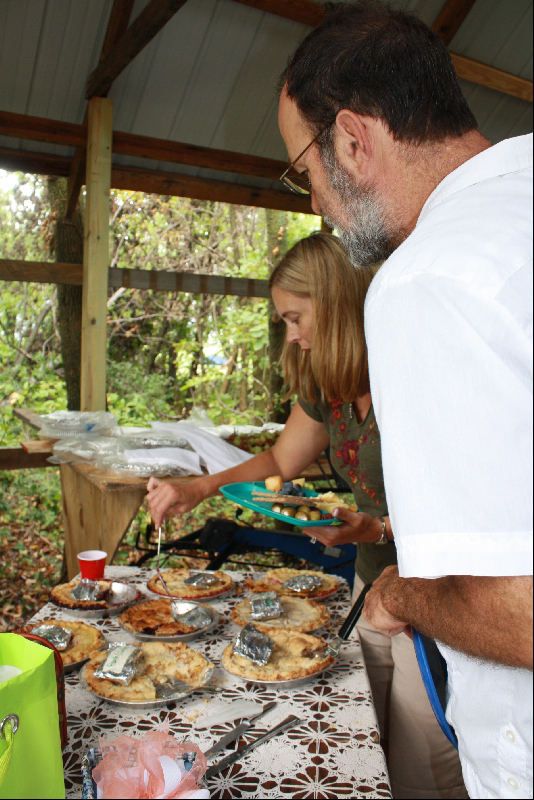 Ariel’s cousin Deb helps me inspect the assortment of pies – 20 total – that we set out to feed the hordes after the ceremony. There were seven varieties: peach, grape, apple, pear-berry, strawberry-rhubarb, mixed berry, and cherry. Almost all of the fruit was grown in our neighborhood. The Prevosts and the Simcoxes were a great help as we anticipated and worked through the end run of the week’s festivities. It was nice to see most of the McCoy clan gather with us on Saturday. We had everyone but Ryan Cascardo, who was already at American University in DC. The four of us basking in the joy of the moment.